A state-run Korean culture center in New York is organizing samulnori music festivals on the East Coast, commemorating the center’s 40th anniversary. 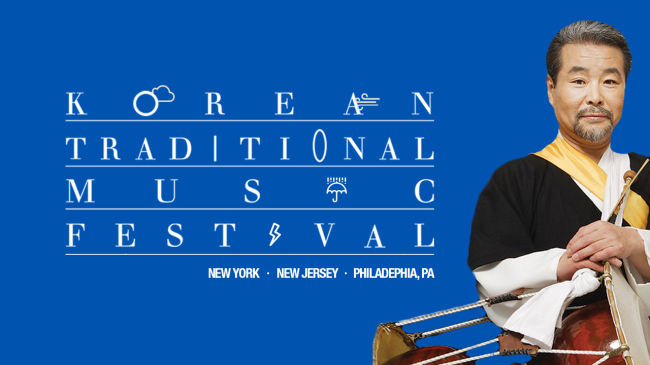 Korean Traditional Music Festival 2018 will be held in May across major East Coast cities, including New York, Englewood, New Jersey, and Philadelphia. It is hosted by Korean Cultural Center New York. Samulnori, which means “playing with four objects,” is a reimagined version of pungmul, a traditional performance involving music, dancing and singing. Samulnori uses four percussion instruments and symbolizes the harmony between nature and people. Leading the performance is the genre’s creator, Kim Duk-soo with his team Hanullim, who performed at the opening ceremony of the PyeongChang 2018 Winter Olympic Games. The samulnori team will collaborate with an orchestra of Korean, Chinese and Japanese traditional instruments and Western classical instruments like the violin and flute. The concerts will be held in New York on May 19-20, Philadelphia on May 22 and Englewood, New Jersey, on May 24. The booklet can be viewed at www.koreanculture.org/samulnori. Other samulnori performances are also slated to take place; “Samulnori in NYC” featuring New York Korean Traditional Marching Band and “YeonHeeBonSaek” featuring Beat Production will take place in New York, respectively on Sept.9, and Nov.9. The date for “Beautiful Concert Inspired by Samulnori,” performed by Beautiful Mind Charity in New Haven, Connecticut, have not been set yet, but it will be in August or September. In addition to the festival, the center will publish an English-language booklet on the genre to aid young people in learning more about samulnori. The booklet explains the meaning, history, types of instruments used and other trivia related to samulnori, and will be distributed to local schools and libraries. For more information, visit www.koreanculture.org, or send an inquiry to performingarts@koreanculture.org.